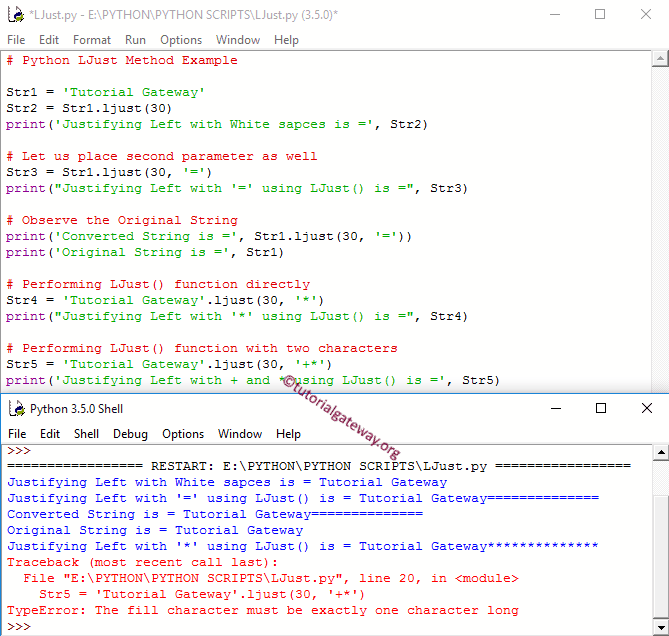 Python Ljust method is one of the Python String Method which is used to Justify the string to Left hand side and fill the remaining width with specified character (By Default white spaces) and returns the new string. In this article we will show you, How to write Ljust() Function in Python Programming with example. String_Value: Please select the valid String literal. Width: Please specify the Justifying length of a string. Char: This parameter is optional and if you Omit this, Ljust() Function will consider the white spaces as default parameter. In order to change the default value, Please specify the Character you want to use in the remaining width. The following set of examples will help you understand the Ljust() Function in Python. Suresh Basinasetty - Passionate Blogger and Software Developer. Here at Tutorial Gateway, I write tutorials on Various Programming languages, Databases, and Business Intelligence Tools (ETL, and Reporting). Follow me: @TutorialGateway.